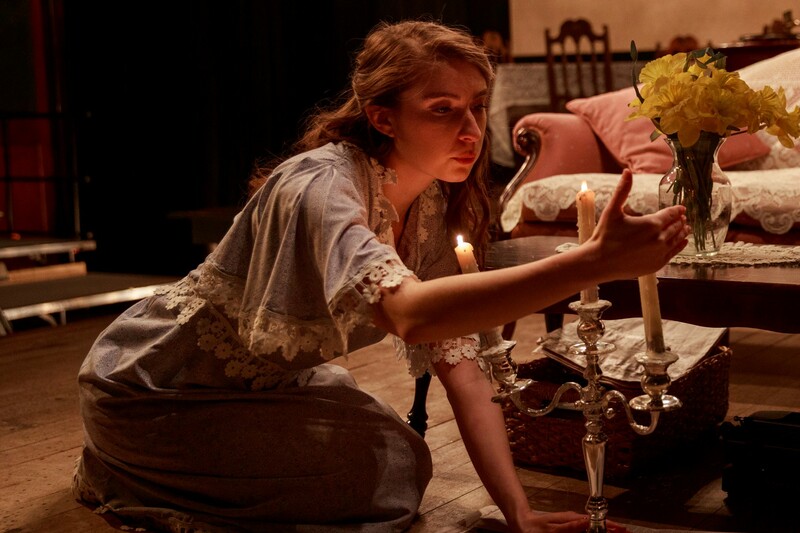 The Cardinal Stage Company is presenting Tennessee William’s The Glass Menagerie upstairs at the Ivy Tech John Waldron Arts Center March 21-April 7. Director Kate Galvin calls it an American classic especially appropriate for these times when youthful ambitions may meet limited opportunities. Steve Pacek plays the Wingfield son Tom, the guide looking back on this memory play. Tom promises to give us truth in the pleasant disguise of illusion, but The Glass Menagerie is a play filled with inflated dreams, disappointment, and guilt. The Glass Menagerie is an intimate play with just Tom his mother Amanda, his younger sister Laura and Jim, a gentleman caller. Francesca Sobrer plays the family matriarch Amanda. Sobrer began reading The Glass Menagerie when she was fourteen. Since, over the years she’s reread it, acted in it and taught it to her classes at Bloomington South. Sobrer confesses love for the character. Amanda laments that she could have married better, but always comes back to a certain pride in her choice of a charmer. Sobrer admires her charm, vivacity and great dreams with special affection for her resilience. Amanda may be disappointed, but only momentarily discouraged. Courtney Reylea-Spivak is the tragic Laura, a girl lost in her own world and the proprietor of the fragile glass menagerie with her favorite, the mythical unicorn. Despite Amanda’s efforts, Laura has failed at business school and secretly spends her days walking about and visiting St. Louis’s museums. Tom has agreed to invite a coworker for dinner. Amanda makes elaborate preparations for the gentlemen caller. Jim, Michael Bayler is charming fellow and with him Laura briefly comes alive. She remembers Jim as a high school hero who nick named her “blue roses.” Her momentary joy is dashed when after a kiss, Jim honestly tells her that he’s engaged to be married. The final scene with Jim, culminating in Amanda’s efforts, Laura’s hesitant opening, the dance, the kiss and the disappointment is so dramatic and memorable that it’s hard to think back over the play. Tom has appeared as a reluctant son from the past and a frequent observer of scenes from the present. The sometimes stormy relationship of Amanda with Tom and indeed with of Amanda with her own past is explored. One of the tensest moments in The Glass Menagerie is the apology of Tom to Amanda for calling her a witch. Tom’s guilt laden final speech of feeling Laura’s hand on his shoulder is eloquent, but probably even for him inadequate. Tom Weaver’s set design works very well for an expressionistic production that flows very nicely. There’s the fire escape entry off to the left, a bit of a balcony and door on the right. The dining room table is to the back on he left with the glass menagerie, and the family couch front center. Becky Underwood’s costuming fits the period and the characters. Steve Pacek’s Tom smoothly moved from playing his parts in the story to being our guide and narrator. Often he appeared on the edges of scenes as if working to remember and see them again with us. Francesca Sobrer fully invests herself into Amanda with wonderful skill from her own experiences as a mother. Courtney Reylea-Spivak does a nicely detailed opening as Jim works to charm her. Michael Bayler’s, Jim the mannerly gentleman caller shared his own post high school disappointment and hopes for the future. They seem as fragile as Laura’s unicorn.